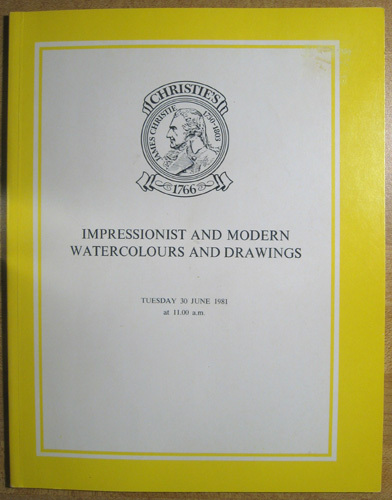 Veery Books — Buy , Impressionist and Modern Watercolours and Drawings; 30 June 1981, Christie, Manson & Woods Ltd.
63 pp. 78 lots. 60 illustrations, 18 in colour. Price sticker shadow, else fine. The properties of Les Archives d'Architecture Moderne, Brussels, the late Paul Joerin of Basle, Eric Levine and from various sources. 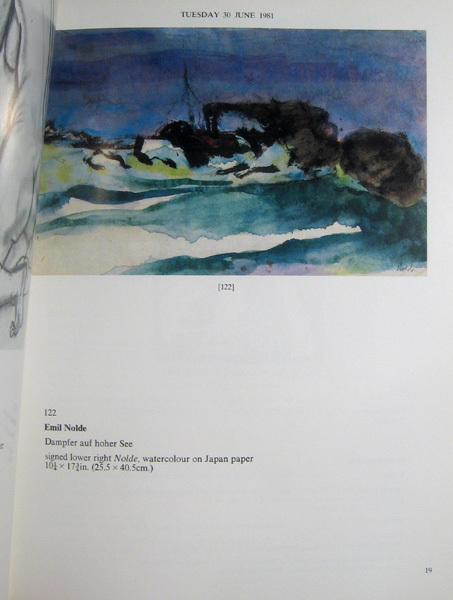 Lots include Boudin, Chagall, Delvaux, Dufy, Dunoyer de Segonzac, Ensor, Fini, Forain, Giacometti, Gleizes, Gromaire, Grosz, Guttoso, Harpignies, Hodler, Kermadec, Khnopff, Klee, Kokoschka, Lam, Larionov, Laurencin, Leger, Lhermitte, Liebermann, Magritte, Modigliani, Moore, Morisot, Munch, Nicholson, Nolde, Pascin, Picasso, Renoir, Schuffenecker, Serusier, Severini, Signac, Sutherland, Tchelitchew, Toulouse-Lautrec, Utrillo, Valadon, and Vuillard.